This Complete Dinosaur Cladogram was completed in 2001 and is now sadly out of date. Until it is updated it is still presented in its original form as a jpg graphic. 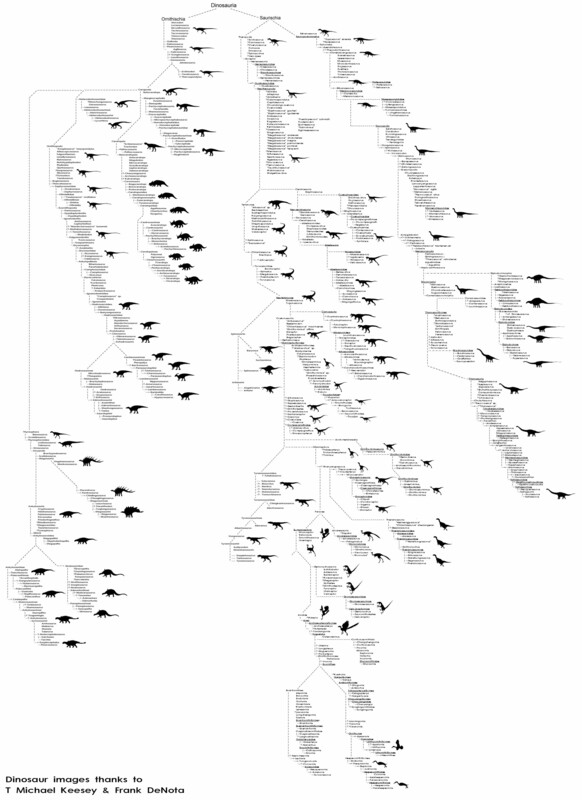 Other cladograms usually come in text format and list all entries vertically. Although these are easy to copy and paste they do not make easy reading.This graphic (or set of three graphics depending upon your viewing preference) should make a useful reference and display item. Many thanks to Steven Coombs for creating the complete data in text form. And many thanks also to T Michael Keesey and Frank DeNote for the use of their dinosaur silhouettes. Click below to view each of the three branches of the tree separately.